The beautiful home on a private 2.41 acre lot at 6224 Belle Rive Drive in Brentwood offers six bedrooms, six full and two half baths offers plenty of space for living and entertaining. 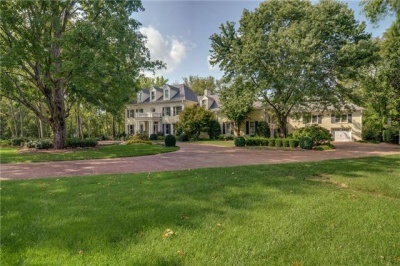 Built in 1987 and renovated in 2008, this exquisite 8,606 square foot custom home is listed at $2,200,000. The entry foyer features a solid cherry front door, inlay hardwood floors and a winding staircase to the upper level. The library features a wall of built-in walnut bookcases and storage room. The dining room sports a chair rail with picture window molding. The kitchen features granite countertops, a middle island with low bar seating, stainless steel appliances and a breakfast area with bay window. The office features a wall of built-in cabinets with desk area and open book shelves. An additional hobby room also features built-in cabinets. The large great room has a stack stone gas log fireplace, a wall of built-in cabinets with media shelf, a wall of arched windows and two sets of French doors to a screened-in porch. A double door entry leads to the master retreat with gas log fireplace, built-in shelves and storage cabinets, French doors to the purch, a laundry room and his and her private baths. The guest suite also features a private bath. On the second level, a 32′ by 23′ recreation room is perfect for entertaining and features wood stained judges paneling on the walls, a wall of cherry wood storage cabinets and bookshelves and a wetbar with high bar seating. There are three more bedrooms on the second level and one on the third level. The third level bedroom features window box seating with storage, two skylights, a bathroom and access to an unfinished storage area. The exquisitely appointed custom home also features a four-car garage, screened-in porch with serene view, fenced-in dog area, easily accessible crawl space, tree lined backyard and backs up to the Harpeth River. A large cedar deck also features an outdoor kitchen with magic grill with two burner unit and refrigerator. What more could you ask for? This home is zoned for Scales Elementary, Brentwood Middle and Brentwood High schools. Click here to view the complete property listing.